Three weeks into our 365 Questions project and already I’ve been challenged by several questions – and I helped write them! 17. What does your perfect day look like? My perfect day would definitely involve waking up at my cottage on a warm autumn day. Why autumn – because that’s my favourite season. There might be two ways I would enjoy the morning. If I was feeling energetic, I would head out for a 45-minute run. If I was feeling less-than-energetic, I would spend the morning relaxing with some reading, writing or talking about life, love and worldly events with my sister or in truly perfect world, my significant other . . . though some would argue that Andrea is my significant other. I would hang out on the sundeck and enjoy the spectacular view. The day would include nibbling on good food, relaxing, making love, maybe a walk, lots of kissing, lying in the hammock, an episode or two of one of my favourite TV shows, and a glass of wine under the stars. Basically doing anything at my cottage pretty much sums up any perfect day. 18. What do you miss about childhood? I miss that innocent part of childhood when you didn’t question anything you said or did. You said or did it because you simply wanted to. No one else’s opinion mattered and everything just felt right . . . because it was. 19. What has love taught you? Love is not perfect. It is messy, boring, painful and absolutely wonderful and rewarding. One of the most important things love has taught me is that you have to choose it. Act on it. Work on it every day. Love has taught me patience and love has taught me acceptance – for who I am and for who others are. And like everything else, if you want to keep getting good at it, you need to practise it . . . every day. This includes loving yourself, friends, family and others. And friends, it is worth it. Every painful, boring, messy and wonderful moment. 20. Where is your favourite place on earth? See the answer for question 17. 21. What historical event do you wish you’d been alive to witness? I wish I could have gone to Woodstock. I realize I’m kind of cheating on this question since I was alive in 1969 . . . but I was just too young to go. It would have been totally cool. 22. Which vice would you indulge in if it had no side effects? It’s not really a vice, but I wish I could eat whatever I wanted without worrying if it contributed to cancer, heart disease, diabetes, cellulose or anything else. This wouldn’t mean I would abandon “healthy” food or exercise but I would be able to eat what I liked without it impacting my life in a negative manner. 23. What’s been the most spiritual experience of your life? 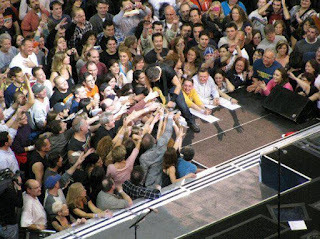 If you look carefully, you can see me just slightly up and left of Bruce's head.